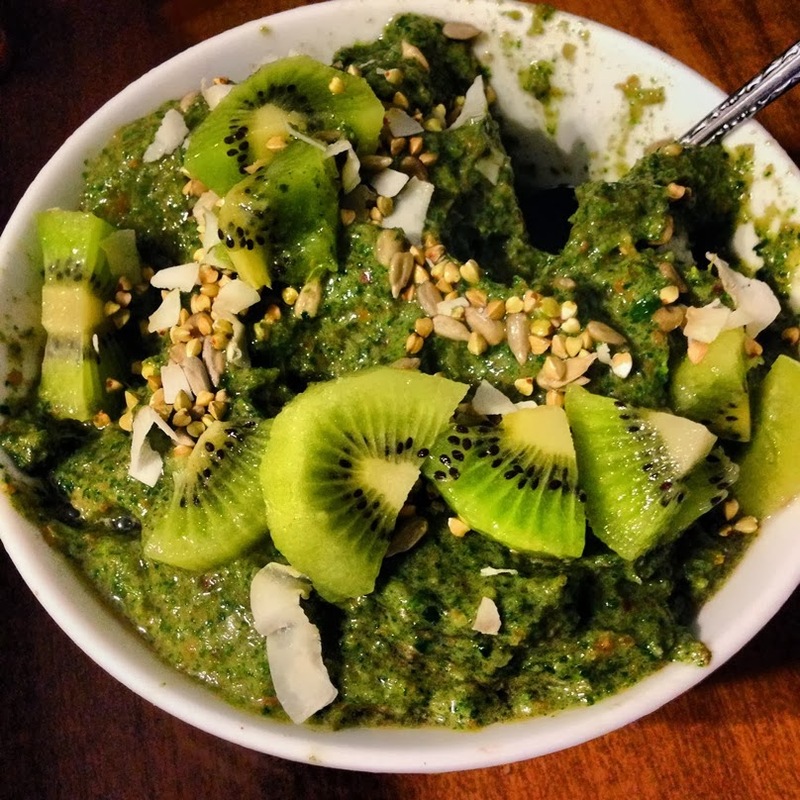 I never know which weeks will turn out a great batch of food pictures. 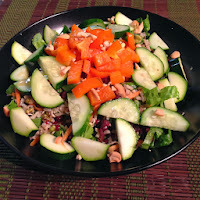 As I spelled out in my post on food decisions, I always make a menu for the week and the food usually tastes good. Some weeks it's just prettier than others! Our first try making cauliflower steaks. Delicious but we could only get 2 steaks out of the head and roasted the rest as florets. 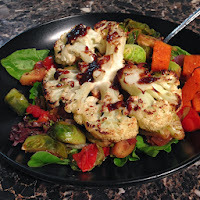 We served it with sauteed sweet potatoes, Brussels sprouts and onions on top of greens. Quinoa with caulifredo sauce. 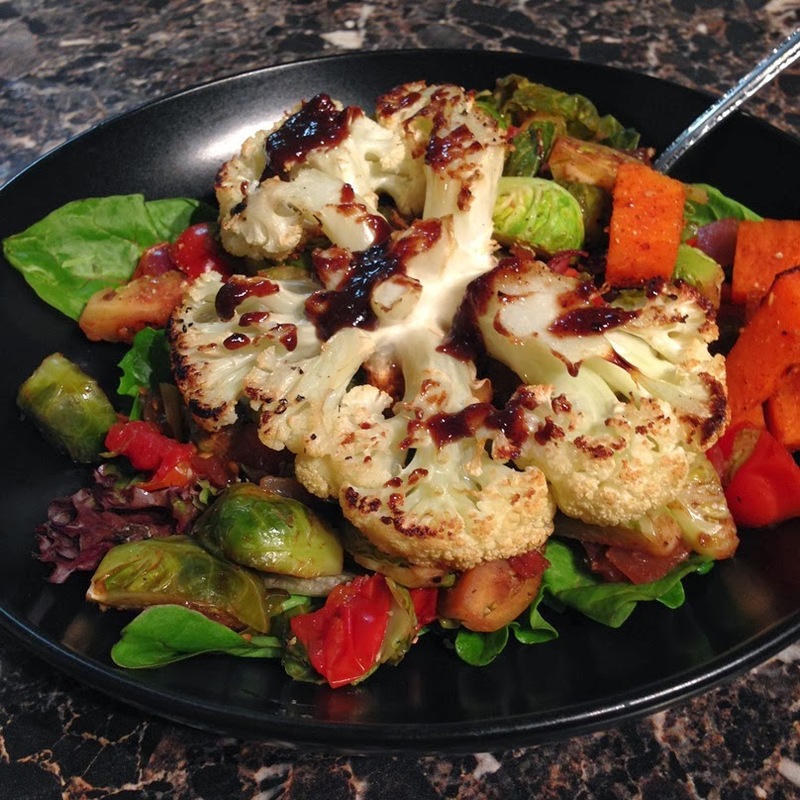 The sauce was made with cauliflower, cashews and nutritional yeast. I mixed it with spinach, zucchini, artichokes and roasted roma tomatoes. 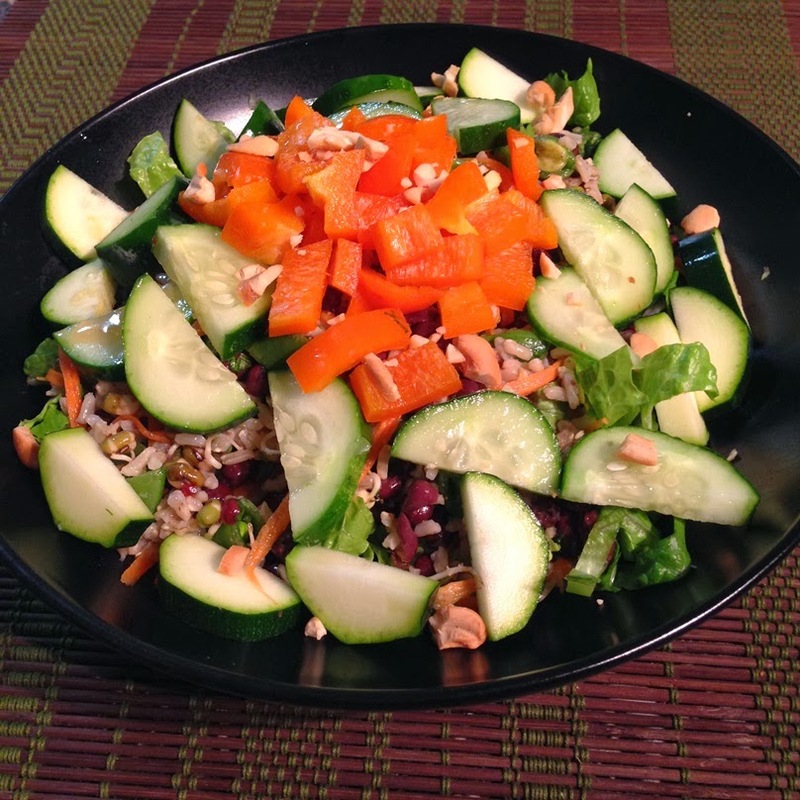 The sweet and sour brown rice salad from "Isa Does It" topped with fresh veg. My Saturday morning smoothie bowl topped with kiwi, buckwheat groats, coconut flakes and sunflower seeds. I've been craving a non-smoothie breakfast, so I got some gluten free raisin bread. 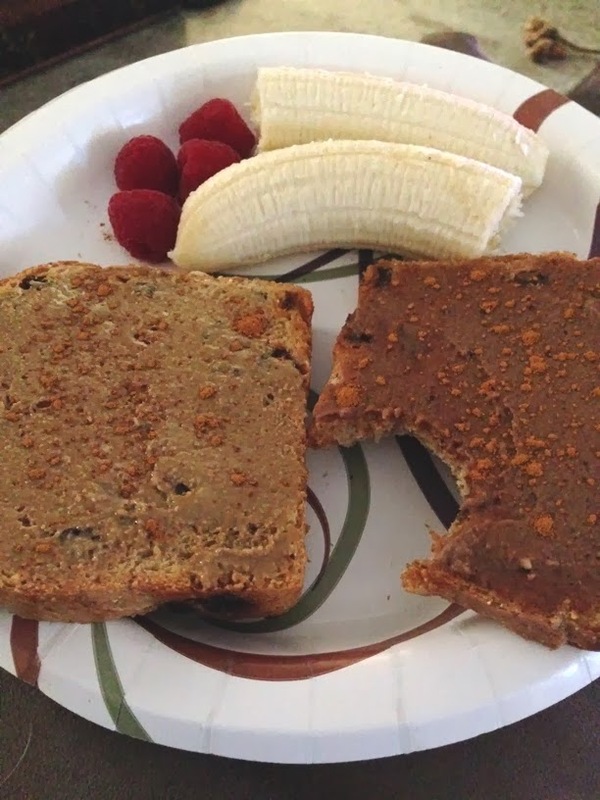 Once slice topped with sunflower seed butter and one with homemade Nutella. 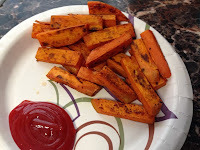 Sweet potato skillet fries sauteed with turmeric and other spices. 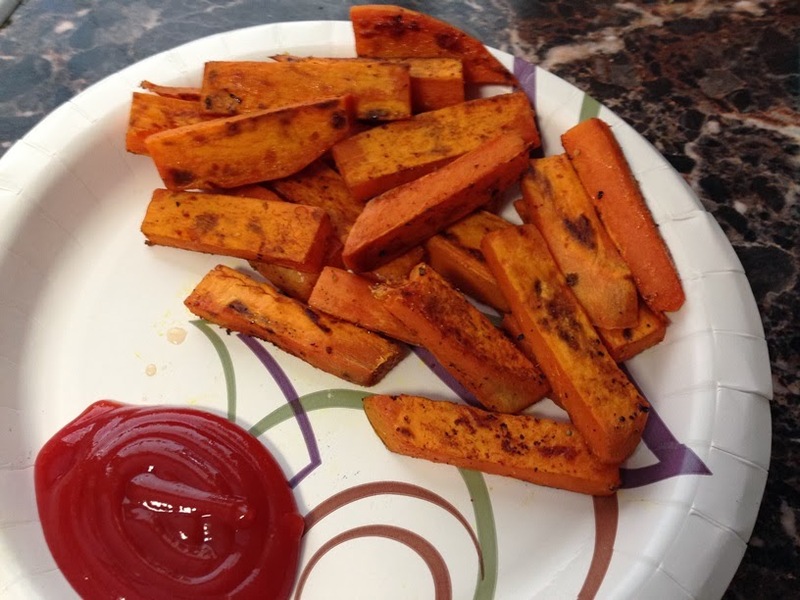 Great as part of a recovery lunch after a long run! 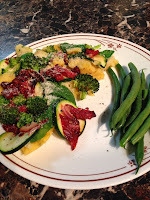 Polenta pizza with a side of green beans. A play on Carolina casserole from Happy Herbivore. 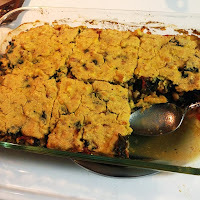 It's basically hoppin John stew with cornbread baked on top. 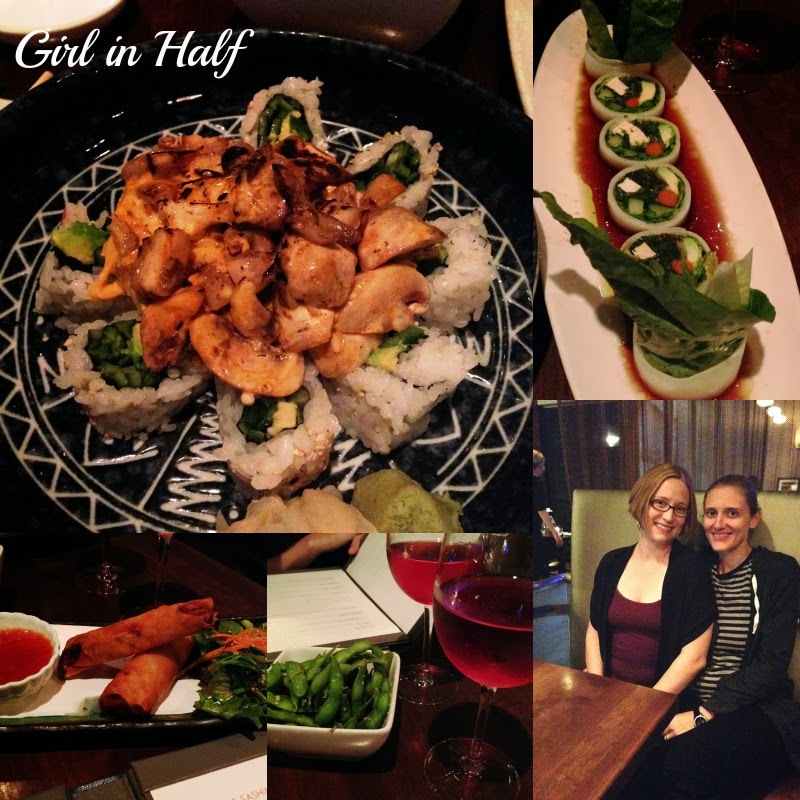 It was quite good! 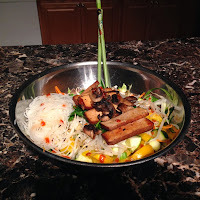 Vietnamese bun salad, we eat this at least twice a month! I made some delicious granola this weekend. 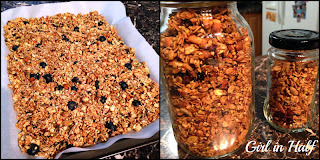 I wish I had written down the ingredients to write a recipe! Saturday night we went on a date to Seito Sushi. It was amazing, especially for vegans! The top left is a veggie roll topped with mushrooms in a vegan spicy cream sauce, top right is a garden roll wrapped in daikon instead of seaweed, bottom left is mushroom spring rolls, bottom middle is our rose wine and garlic lime edamame, bottom right is us! 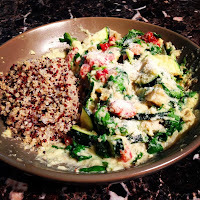 Quinoa with caulifredo sauce looks fantastic and easy to make! I can't wait to try it. Love your blog Carrie!